On Friday nights a time warp hits downtown Escondido! The streets are filled with strolling people of all ages, while a parade of pre-1970s vintage cars slowly cruise up and down Grand Avenue. 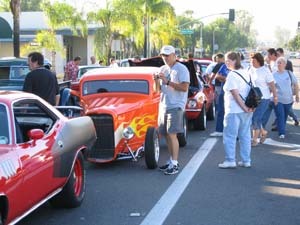 All kinds of vintage cars—from American Hot Rods, Classics, Antiques, and Customs—help make seven blocks of Escondido the place to be on Friday nights! Wine & Craft Beer Tasting at Cruisin' Grand May 19th! Get your tickets now!